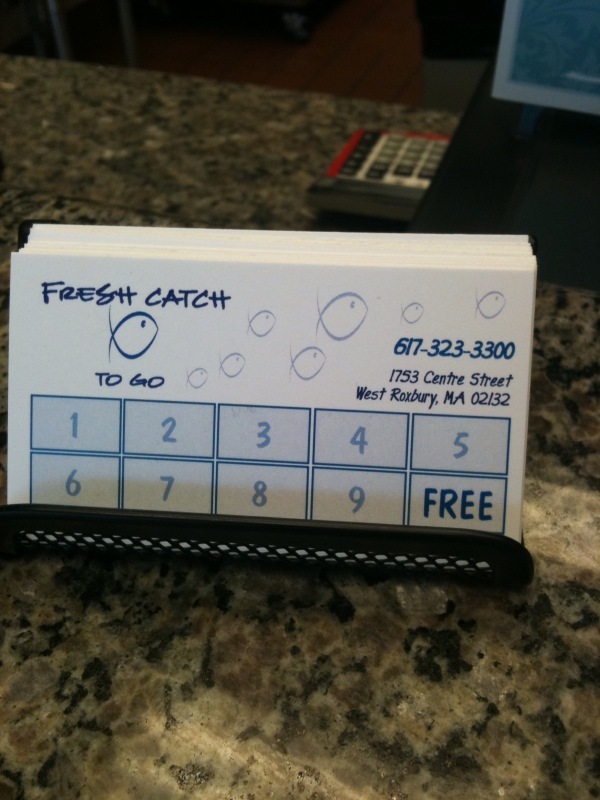 About two years ago, a new takeout seafood place opened up on Center Street in West Roxbury… Fresh Catch To Go. I wondered how they would do, as the location has limited parking and they are strictly takeout. Also, they joined the restaurant business just as the economy tanked. But two years later, and they are still there and seem to be doing okay. I have no idea why (as I LOVE seafood), but I never got to Fresh Catch until about 3 weeks ago. The place where I get my pedicures is right next door, but the restaurant’s hours are a bit limited (closed on Sun/Mon, 4-9pm on Tue/Sat and 11am-pm on Wed/Fri)… so I guess it just never worked out for me until now. I went in (of course), after a pedicure. It was early… about 11:30am, so it was quiet (no other customers). 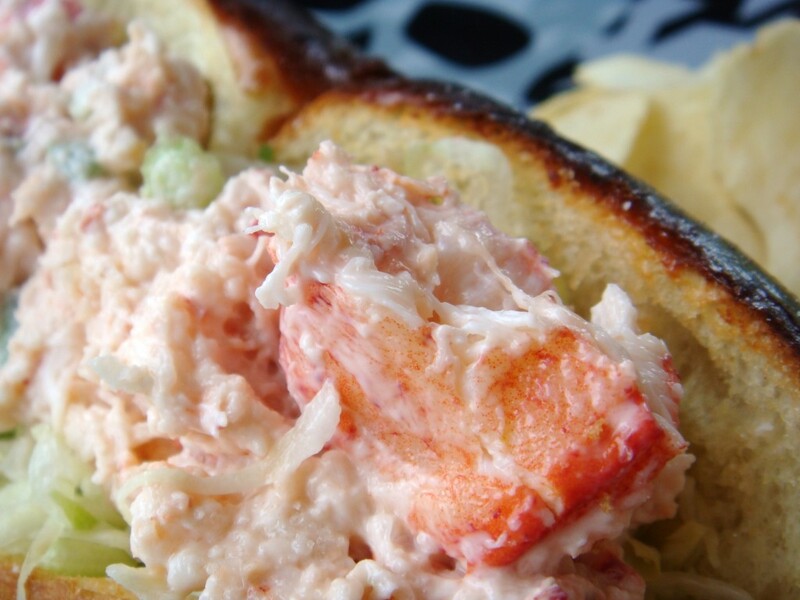 I knew what I wanted., so I ordered immediately… my summer addiction: a Lobster Roll. After ordering, I chatted with the owner for a few minutes while I waited. I asked where they get their seafood from and she told me they go down to the piers in Boston every day for fresh fish and seafood. So, whatever you get from this place is just off the boat! You can’t get much fresher than that. I also asked how restaurant was doing and she inidicated that they’re “hanging in there”. My guess is that they have had to revamp the hours (cutting them back) to help cut costs of lost inventory. It too was served on a split-top hotdog bun, that had been toasted on their griddle. I did not notice if she buttered it, as in traditional New England fashion, but I did notice this was definitely a purist lobster roll. Meaning, nothing but meat and a little mayo… barely any in fact. No lettuce, no celery. The bun was loaded with sweet, fresh, delicious meat and came with a large portion of french fries. The entire thing cost me about $15.95. The fries were a bit soggy, but otherwise tasty. I really enjoyed my meal. Compared to my $5.99 lobster roll from Roche Brothers (pictured above), was this worth the extra $10? Well, it did come with a large portion of french fries, did not have added fillers like mayo, celery and lettuce and had a significantly larger portion of lobster meat. That, coupled with the fact that I know it came off the boat either today or yesterday and I’d have to say yes… it was worth it. The basic menu consists of Fried Seafood Dinners, Broiled Seafood dinners, Sandwiches, Side Orders and a Kids Menu (which includes non-seafood items like chicken nuggets and hot dogs). 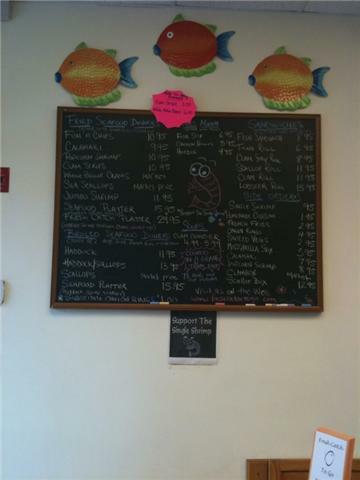 There are also a couple Sauteed Specials and Soups. My only comment about the menu is that it’s not for the dieter! Most items are fried… there aren’t any salads or healthy options. All dinners come with either french fries and cole slaw or a choice to two sides (french fries, cole slaw, veggies or rice pilaf). They have a “frequent diner card” that you can get stamped for every “dinner” you buy. Buy 9 dinners and get the 10th for free!!! I can’t say that I’ll be buying one single shrimp anytime soon, but I could see myself wanting just 3 or 4… so, sounds like a good deal to me! I say support this local business by paying them a visit. It’s a tough economy and it’s a great thing to support the little guy… especially when he/she is serving up affordable, freshly-caught, seafood!